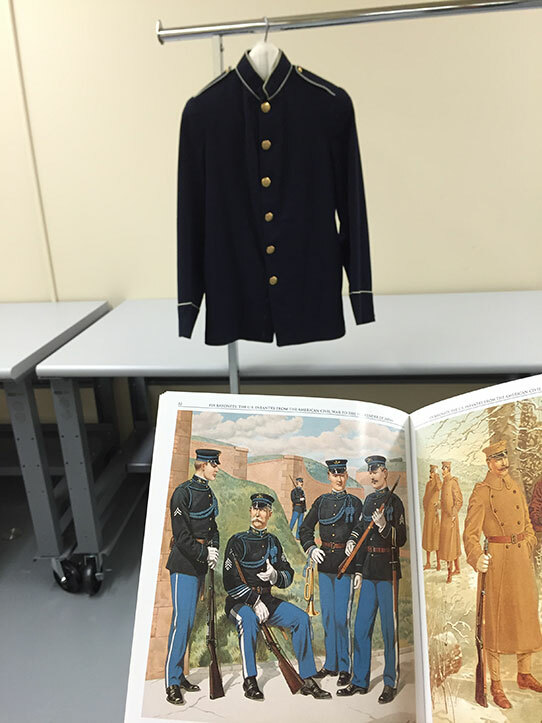 One of the strengths of our museum collection is the military uniform collection. Ranging from the Civil War era to Operation Desert Storm, there are hundreds if not thousands of pieces, both from peacetime and from major wars. Prior to the expansion project of the ND Heritage Center, the space we had to house this collection was very limited. As a result, uniforms of different time periods were stored together in fairly cramped conditions. Pictured is the original row in storage for military uniforms. Because space was very limited, items were overcrowded and a bit random, with the uniforms of different branches of service, time periods, and countries mixed together. With the recent expansion of the Heritage Center, the Museum Division was fortunate to receive an additional 5,000-6,000 square feet of storage space, and we have been working hard to fill and organize it. 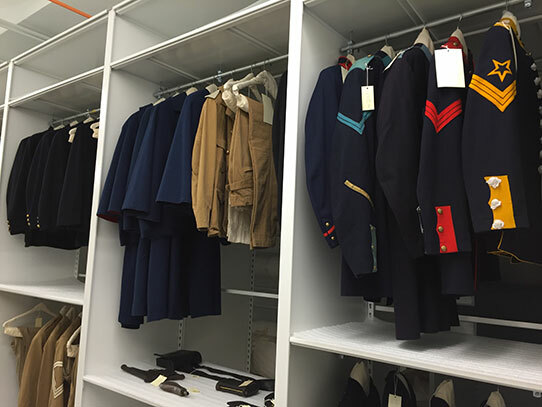 We saw an opportunity to rehouse the military uniform collection. Starting in late August, I began transferring the collection over to the new area. The first step was figuring out a hanging system for the uniforms. The system needed to work with existing shelving units, but ready-made hanging components from manufacturers can be cost-prohibitive. That meant coming up with a custom solution ourselves. After a few trips to the hardware store, we decided to use ¾” conduit that I cut in-house, and then secured it to the shelves with screws and conduit hangers. 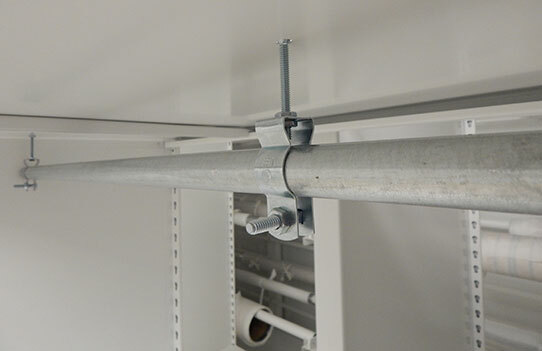 The hardware we used for the hanging system was very simple: sections of ¾” conduit cut to fit the width of each column of shelving, hung from the shelf above it with screws and conduit hangers. The screws fit through existing holes in each shelf. The total cost for the hanging system will be under $200, and all of the components were purchased at a local hardware store. After the hanging system was in place, it was time to start transferring the uniforms. It seemed to be the perfect project for me, because I got my start in museums as a costumed tour guide at Fort Mackinac, a state historic site in Michigan. In addition to firing a rifle and cannon, we spent a good deal of time talking about the uniforms we wore. I thought I knew army uniforms. I soon found out that I had quite a bit to learn. I decided to arrange the uniforms in chronological order, separated by branch of service. The items I started with were accepted as early as the 1920s, and I don’t think they had been cataloged since that time. Most had no photos on file and vague or sometimes very inaccurate descriptions, which can make it difficult to determine the date of a uniform, especially from more obscure interwar periods. Over the last month, I have spent quite a bit of time leafing through reference books and performing Google searches. At one point, I even contacted a historian at the North Dakota National Guard for assistance. It has been challenging, but honestly quite fun. I am expanding my own knowledge and adding information to our files, while at the same time, majorly improving the storage conditions for an important part of our collection. An artist named Henry Alexander Ogden was commissioned by the US government from the 1890s to the early 1900s to create illustrations of US Army uniforms from throughout American history. This Ogden illustration, found in a reference book, was especially useful in identifying the M-1902 dress blouse you see in the background. The 1902 dress uniform is similar in appearance to the US Army’s current class A uniform. As items are placed in their new location, I try to make sure there are a few inches between garments to ensure they don’t touch. I also make sure any hangers used are adequately padded. Both things help to prevent strain and potential damage to the materials and make the uniforms easier to access. 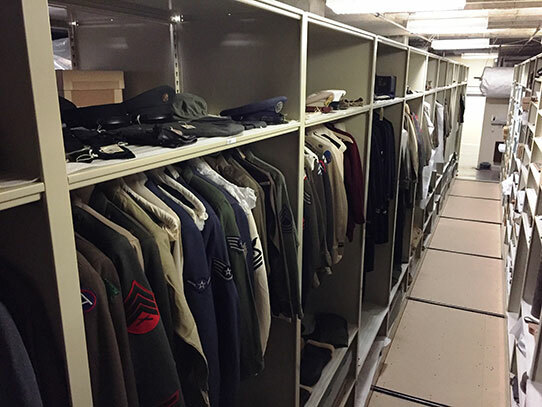 The military uniform collection will now be housed in two rows of storage instead of just one, allowing us to decompress them and even leave room for expansion. Uniforms are arranged chronologically and separated by branch of service. So far, I have rehoused uniforms dating from 1860-1906. So far, I have made it to 1906 with another century’s worth of uniforms to rehouse. It is a challenging project, but one I am excited to continue! Langellier, John P. Fix Bayonets: The U.S. Infantry from the American Civil War to the Surrender of Japan. London: Lionel Leventhal Limited, 1998.